Crafted by hand from the finest materials, 'Balgara' miniature musical carousels embody all the beauty of an amusement park carousel - exclusive detail, colourful lighting, joyous movement and wonderful music - but small enough to fit on a table. 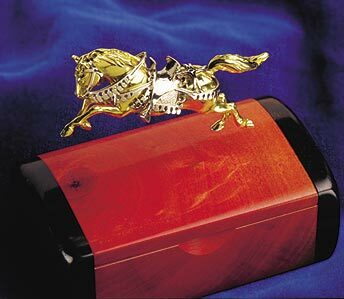 Each of the eighteen horses has a finely detailed body, mane, tail, saddle, rein and stirrups designed and created in intricate detail by master jewellers. The horses rise and descend as they travel around the carousel, accompanied by music that brings back childhood memories of fairgrounds and circuses. A sleigh and gondola add to the charm and beauty. Each carousel is a work of art and has a personality of its own, taking several months to produce. As a result, they are only produced in limited quantities each year. 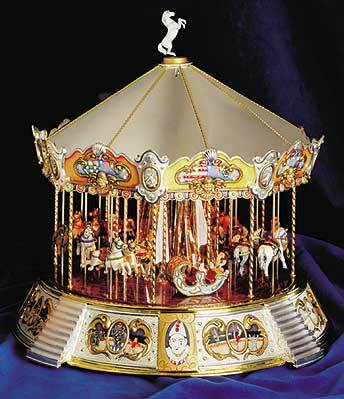 Each carousel is individually named and hallmarked, guaranteeing its uniqueness and authenticity. 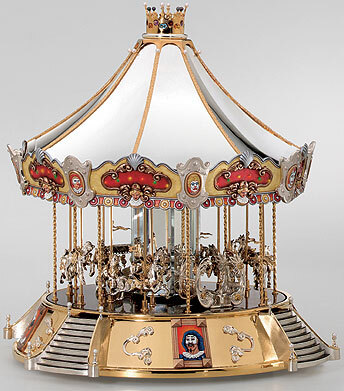 The Kindertraum ("Child's Dream") carousel was created exclusively for Wempe's 125th Anniversary. It is a unique piece, crafted from gold and silver, studded with gems and pearls, and playing four different melodies. Its genesis required the work of fourteen assistants, 9 lbs. of sterling silver, 2 oz. gold, 134 diamonds, 37 pearls, and eighteen months of passionate dedication. For more information, see www.wempe.com. Explore the beauty of these exquisite hand-carved sculptures and brooches, made with uncompromising quality and an eye for detail. These magnificent pieces capture the true beauty of a horse in motion, with a high level of detail highlighting the mane and facial features. The horses are skilfully handcrafted, ranging from Sterling Silver through to a beautiful 18ct yellow Gold pave set with brilliant cut diamonds in 18ct white Gold. The ornamentation is hand made, resulting in each horse having a unique appearance. Luxurious Swiss music boxes from famous names such as Reuge, plus some delightful music boxes for children including girls ballerina jewellery boxes, picture music boxes, musical carousels and even musical movements for making your own music boxes. 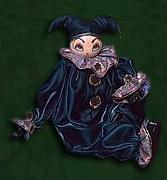 An interactive and educational source for people with an interest in the history of carousels, amusement parks and related subjects.